"Today’s groundbreaking numbers are demonstrative of what I’m hearing everyday from small business owners – that business is booming. As the tax and regulatory landscape changed, so did small business expectations and plans. We’re now seeing the tangible results of those plans as small businesses report historically high, some record breaking, levels of increased sales, investment, earnings, and hiring." Duggan's also noted in the report that earlier in the positive trend higher in the index was the fact many of the component gains were dominated by what she calls expectations, i.e., good time to expand, expected real sales, expected business conditions, etc. Today, the highlights in the report are related to real business activity, i.e., job openings, inventory investment plans, capital spending plans, etc. This real activity data is supportive of higher GDP growth as one looks ahead. Some of this real activity data can be seen below with the noted survey components at high levels. 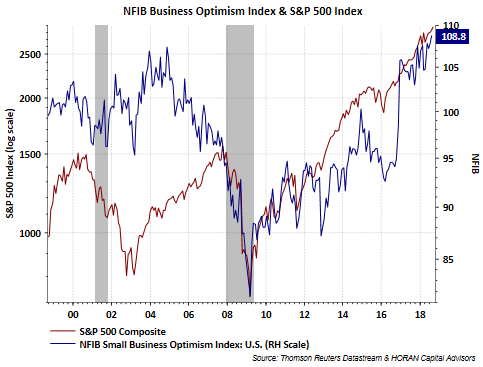 Small businesses are a critical part of driving economic growth and today's survey indicates the current economic expansion has further room to run to the upside.